Symbolic by design, a Hard Rock Hotel & Casino is under construction in Florida. It will be the world’s first-ever guitar-shaped building. 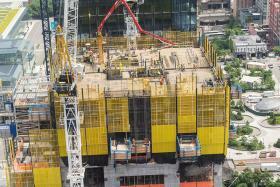 Formwork systems from Doka give the complex its unique contouring. 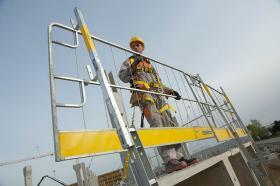 Working with Formwork: Are you Safe? In tough everyday construction site situations, everyone should be aware of the safety precautions needed for formwork that will ensure a safe jobsite. Worksite safety is the responsibility of all involved – from the engineer to the contractor to equipment suppliers and, of course, the workers themselves. The safer the work environment, the fewer accidents, or even better none at all, with the added benefit of increased productivity at the worksite. Perimeter protection screens allow NYC’s Hudson Yards skyscrapers to safely soar. 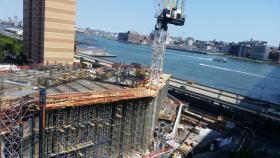 The massive Hudson Yards urban development project in New York City has so far gained two titles: the nation’s largest private real estate development and the most complex construction project in the city’s history. The megaproject has essentially created 28 acres of new land in Manhattan by covering a large working rail yard. From this new land, several skyscrapers are rising to provide more than 1 million square feet of high-end retail and mixed-use space and 18 million square feet of amenity-packed commercial and residential space. When completed, the development also will include a cultural arts center, a public school and 14 acres of public open space. 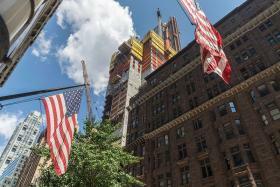 The world's tallest residential building, the Central Park Tower will top out at 1,550 feet. It is currently under construction in New York City. The method of construction is special and Doka's automatic climbing platforms are the ideal solution, both fast and safe. The building is due for completion in 2020. In Southern Ontario, Canada, immediately east of Toronto in Durham Region, is the growing area of Markham/Pickering. This area is designated to receive more development and population in the coming years, straining the current sanitary sewer resources. To handle the upcoming growth, a trunk sewer was contracted to accommodate the additional sanitary sewer flows projected from the future growth. Doka’s Framax Xlife stripping corner has successfully been used in forming cores/shafts on thousands of projects around the globe. With a simple built-in ratchet design, all the work of retracting or expanding formwork can be done by one worker at the top of the core. The built-in ratchet makes the operation safe and fast. In accordance with accident prevention guidelines, no crane is required for expanding to set or contracting to strip the core forms. 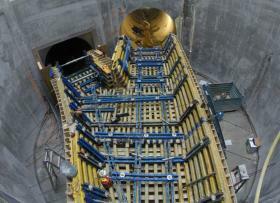 The formwork unit can then be repositioned in a single lift to save crane time. 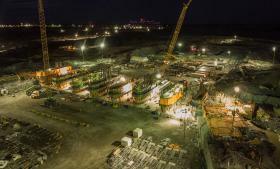 Doka's biggest ever power-plant contract in North America: for the construction of the Keeyask Generating Station 300,000 sq ft of Doka formwork are in use. Doka’s services on this site range from engineering and consulting, up to pre-assembly and instructions for a safe use of the formwork systems. Completion is scheduled for 2021. 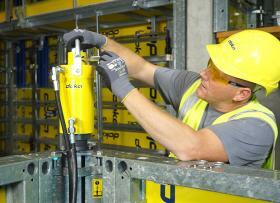 Doka launches new innovative product lineup of internet-connected sensors. 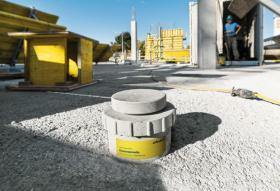 Concremote is integrated in Doka formwork and measures real-time compressive strength gain of fresh concrete. Reliable performance data is vital to support decisions for subsequent construction works. Reference cases underpin optimization of construction schedules and costs while simultaneously enhancing concrete durability. Located at 250 South Street in New York City, a new tower, known as One Manhattan Square, is currently being built on the site of a former Pathmark grocery store. When complete, the 80-story building will stand out significantly within the context of the neighborhood, since the next highest structure in the immediate area is the 330-foot-high Manhattan Bridge. At bauma 2016, the largest trade show for the building sector worldwide, the international formwork supplier Doka presents itself from an entirely new side. Aside from the new location with increased booth space, visitors find a modern fair concept that is close to builders and buildings: Doka Campus. On a nearly 4,000 m² booth on the open-air area north/west, booth no. FN.420, the formwork experts make one thing very clear: Doka is not only a partner in planning and implementing mega-projects but also a provider of ideal solutions for small and mid-size companies. Thank you for your interest - Press. Thank you very much for your interest - Press.